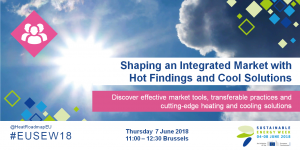 On Tuesday 5 June 2018, Heat Roadmap Europe hosted a stand at the EUSEW Networking Village, where visitors were introduced to Peta4.2 and invited to explore HRE tools firsthand. HRE experts provided on-the-spot training for attendants to perform their own analysis. On Thursday 7 June, Heat Roadmap Europe hosted an interactive panel discussion focusing on discovering effective market tools, transferable practices and cutting-edge H&C solutions driving the decarbonisation of Europe’s energy systems. HRE coordinator Brian Vad Mathiesen kick started the discussions by introducing the projects latest findings. 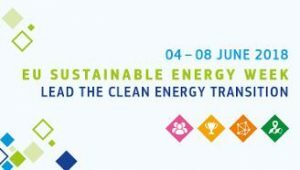 Based on that the expert panel composed of high level EU policy experts like Paul Hodson (DG ENERGY) encouraged the rethinking of Europe’s H&C through holistic and next-generation solutions and to present technically and economically-feasible pathways to decarbonise H&C. The session was co-organised with the Polish National Fund, the Polish Chamber of Commerce for District Heating and the H-DisNet H2020 project. See more in agenda . This project has received funding from the European Union’s Horizon 2020 research and innovation programme under grant agreement No. 695989.